The rise of carbon dioxide gas in our atmosphere has been measured continuously since 1958 and follows an oscillating line known as the "Keeling Curve," named after Dr. Charles David Keeling, professor at Scripps Institution of Oceanography. A renowned expert on the way carbon moves through our planet�s environment, Keeling was the first to measure carbon dioxide in the atmosphere on a continuous basis. He discovered its annual fluctuations (the little squiggles in the curve) and was the first to report that global atmospheric concentrations of carbon dioxide were rising. The concentration of carbon dioxide is given in units of parts per million by volume, also abbreviated �ppmv.� (For the more scientifically inclined: ppmv is the same as what chemists call the �mixing ratio� of a mixed gas, in this case the ratio of carbon dioxide molecules with all other air molecules, because equal volumes of gas at equal pressure hold equal numbers of molecules.) Before the industrial era, circa 1800, atmospheric CO2 concentration was between 275 and 280 ppmv for several thousand years (that is, between 275 and 280 molecules of CO2 for every one million molecules in the air). This we know from the composition of ancient air trapped in polar ice. Carbon dioxide has risen continuously since then, and the average value when Dr. Keeling started his measurements in 1958 was near 315 ppmv. By the year 2000 it has risen to about 367 ppmv (that is 367 molecules of CO2 for every one million molecules in the air). Thus, it is higher than pre-industrial values by one third of the pre-industrial era. Nothing illustrates more strikingly the atmosphere�s tremendous reactivity than the seasonal change seen in the carbon dioxide concentration. The range of change is a full 3 percent every year! This discovery, made by Charles David Keeling while attempting to measure the precise level of carbon dioxide in the atmosphere, was a complete surprise. Dr. Keeling was asked to determine precisely how much carbon dioxide is in the atmosphere. The idea was to make similar measurements some years later, to see whether carbon dioxide might be rising from human emissions. Everyone naturally assumed that a precise measurement would settle the matter for some time, because the atmosphere is well mixed and there was no reason to think that concentrations would change perceptibly from one year to the next and especially not within the same year. Fortunately for carbon cycle science, Dr. Keeling tends to be extremely skeptical toward all assumptions, reasonable or not. So, having already gone to the trouble of building an instrument for high-precision measurement, he decided to make measurements at least through a full year. After re-rechecking the instruments to exclude any malfunction, it was clear that the carbon dioxide changes seasonally over quite a large range. In addition, continuing the measurements showed that the values drift upward from one year to the next. After these discoveries, the science of the carbon cycle had changed forever. Since then, the "Keeling curve" has become the symbol of the ever-changing chemistry of the atmosphere and the associated warming of the planet. The next problem was to figure out why the carbon dioxide varied the way it did during the year (i.e. the little squiggles). Was it processes on land, having to do with plant growth? Or did it come from the ocean? There are ways to distinguish between the two possibilities, and the answer is that the little squiggles in the Keeling curve are actually due to land plants. Since most of the land is in the northern hemisphere, the fluctuations are greatest there. (If the ocean were to blame, we should see a larger effect in the southern hemisphere.) Every spring, when trees leaf out and grasslands and farmlands green, the carbon dioxide in the air decreases, reflecting the uptake from photosynthesis. Conversely, in fall, when leaves and wilted plants are returned to the soil and decay, the carbon dioxide rises again. Thus, one can envision the Earth �breathing� on an annual cycle, and we can measure how deeply. 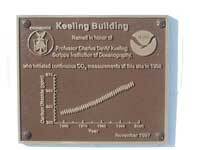 In 2002, Dr. Keeling received the National Medal of Science from the President, for his work on the chemistry of the atmosphere and the carbon cycle.